If this outfit were a mammal, it would be an elephant. We’d be an elephant because of its twenty-two month gestation period. We’re pretty good at getting things started but…some things just take a while. Case in point: our Proximity Hotel project. It’s coming along nicely, but, because it’s our intent that this first hotel become a model for future hotels, we are measuring twice (truth be known, more like about eighteen times) to cut once. Our bet is that we’ll have the plans and the location nailed down by late summer so that we can start building this fall. Read on and we’ll tell you more about these things. Plus, we’ll offer you a bribe to sign up for luck-E-news, and you’ll learn about how we have stepped into this century by embracing the internet. You’ll see how to always get the BEST RATE at the O.Henry Hotel, and how to get a $50.00 amenity Gift Voucher if you book a room for this July using our website, ohenryhotel.com. Plus, you’ll learn about making restaurant reservations at the Green Valley Grill online, and how you’ll be able to place Get Lucky & Go orders online. Get our Best Rate at O.Henry Hotel plus a $50 Amenity Gift Voucher when you book online at ohenryhotel.com to stay this July. While you’re at ohenryhotel.com, sign our Online Guestbook to be automatically entered into a quarterly drawing for a free overnight weekend stay, and receive periodic updates and special offers, but never more than once a month. Here’s a bribe: sign up for luck-E-news at lucky32.com and get ten free $10 Gift Vouchers emailed to you throughout the year, unlimited access to our most requested Lucky 32 recipes, email updates on menu changes and events, and more! Rambling: Times They are A-Changin' or…21st Century Here We Come! It’s sort of a hoot how sometimes our electronic devices can sort of “own us” – it can be a love/hate relationship. Here’s an illustration from my childhood… I can imagine it like I’m right there… While growing up (or at least getting older) in Montana, my stepfather drove truck. One night I was riding with him. He had a load of studs for the planer mill in Darby from the Conner mill. He stopped to bump the tires and his flashlight wouldn’t work. He did the normal thing and started shaking it around and cussing like the sailor he had once been. Finally, he just threw the flashlight out in the woods and…, as fate would have it, it came on and shined right back at him through the trees. He was none too tickled with this development and I knew not to say a word. It was a quiet ride on into Darby. He had been snake-bitten by the low technology of that era. Imagine how he might treat a cell phone! My point, you ask? Times are a-changin’ if, in half a generation, we can move from rejecting flashlights to embracing the internet! At ohenryhotel.com we’re offering online reservations so you’ll not only be able to reserve O.Henry Hotel rooms directly from our website, but you’ll be assured of always getting the very best rate. So, if you want to take a little break and stay with us for the weekend, just visit our website and get the best rates available, plus find out what’s happening around town from our list of “Top 10 Reasons to Visit Greensboro.” We’ll keep this list updated so you’ll always be in the loop. And, don’t forget our incentive to use ohenryhotel.com to make reservations: book a room online for this July and get a $50.00 amenity Gift Voucher for use on just about any amenity, in addition to getting the best possible price (go to ohenryhotel.com for the fine print). At greenvalleygrill.com we’re partnering with OpenTable (it’s the leading online restaurant reservation company) to make online reservations available. We think you’ll find this feature extra useful because you can make dinner, lunch or brunch reservations 24 hours a day, whenever it’s convenient for you. Visit lucky32.com the next time you want to place a Get Lucky & Go order – it will be a breeze. Just like always, we’ll cook, then bring your order to your car, rain or shine – the only difference is, you won’t even have to call! So, if you’re heading in from out of town and you just know you won’t want to cook when you get home, you can place your online order anytime and we’ll have it ready and waiting for you. Now, we may not have everything quite up to speed by the time you get this letter, but it won’t be long. Make sure you stay in the loop by signing up for our luck-E-news at lucky32.com, or sign our Online Guestbooks at greenvalleygrill.com and ohenryhotel.com. We promise we’ll only send you news or an offer we’re pretty sure you’ll be interested in, and sometimes even some gift vouchers. But we’ll never, ever give your name or address to anyone else. The Slow Food Convivium of the Piedmont Triad presents workshops on Growing, Cooking, Tasting and Living, and a multi-course “slow” lunch provided by the Green Valley Grill. Meet regional growers, talk with lovers of good food, and learn about the people and places that create quality food in our region. Join us for the Slow Food Symposium on October 1, 2005 at the O.Henry Hotel in Greensboro. It’s a celebration of good food! For more information go to ohenryhotel.com. To register, contact Leah Thompson at 336-370-0966 x 350, or email slowfood@qwrh.com. The cost is $85 for Slow Food USA members or $110 for non-members and includes all workshops and a multi-course lunch. Also, if you’d like to make a weekend of it, stay overnight at the O.Henry Hotel and be sure to ask for the special “Slow” rate of $139 ($80 off our regular rate of $219). The Green Valley Grill and Lucky’s have garden-like outdoor dining rooms that are perfect spots for enjoying an alfresco lunch meeting, a leisurely dinner or a late-night snack. Our full menus are available until “late night” when we serve a lighter menu. Plus, the courtyard at our Winston-Salem Lucky’s will be swinging most Thursday evenings this summer with live Jazz in the Courtyard. Visit lucky32.com for exact dates and performers. And, just in case you didn’t know, we serve brunch on Sundays starting at 10 a.m. at Lucky’s and 9 a.m. at the Green Valley Grill. We also serve brunch on Saturdays at our Lucky’s in Greensboro, North Raleigh and Cary starting at 11:15 a.m.
Like most things, our Field Truck Initiative is evolving. We’re partnering with ECO, a locally grown food network and distributor, to bring the freshest local food to our tables. ECO is helping us meet the demands of our five busy kitchens and making sure that we’re serving the highest quality local ingredients whenever possible. ECO’s mission is to improve consumers’ access to locally produced, delicious organic produce, and to support the farmers that are working to maintain the beauty and sustainability of the Carolinas. We’re also still partnering with folks such as the Goat Lady Dairy, Giacomo’s Italian Market, Niman Ranch and Counter Culture Coffee. Plus, our award-winning wine lists include several selections from North Carolina wineries. For more information about these and other Field Truck Initiative partners click on the “Menus & Wine List” links at lucky32.com or greenvalleygrill.com. On July 20 at 7:00 p.m. at our Winston-Salem Lucky’s, award-winning winemaker Mark Friszolowski of Childress Vineyards in Lexington, North Carolina will join us for a wine dinner. He’ll talk about his winemaking techniques, some of his favorite selections, and why they taste so good with certain foods. Join us and find out why North Carolina’s own Yadkin Valley is quickly becoming known for its wonderful wines. Cost is $50 and includes a five-course dinner with wine pairings. 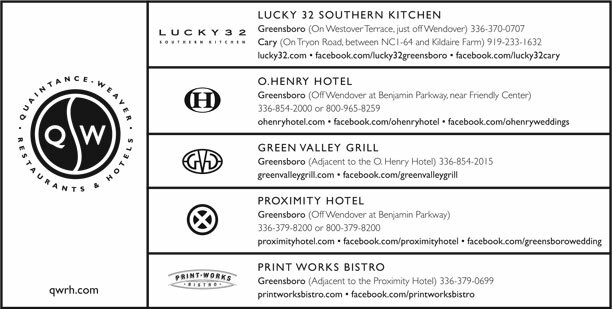 On July 27 at 7:00 p.m. the Green Valley Grill is hosting a wine dinner at the O.Henry Hotel in Greensboro. St. Francis Winery owner Joseph Martin is joining us from Santa Rosa, California to discuss some of his favorite wines. St. Francis Winery was founded in 1971 in the heart of Sonoma Valley and is known for its commitment to producing extraordinarily full-bodied wines from 100% hand-picked Sonoma County grapes. Cost is $65 and includes a five-course dinner with wine pairings. If you’d like to stay overnight at the hotel, be sure to ask for the special “Wine Dinner” rate of $144 ($75 off our regular rate of $219). For more information and reservations contact Leah Thompson at 336-370-0966 x 350 or lthompson@qwrh.com. Space is limited, so please make your reservations early. Peel and julienne onions. In a large soup pot melt 1/3 pound butter. Sauté onions in hot butter until lightly browned and caramelized. Add lemon juice, white wine and chicken broth. Simmer for five minutes over medium high heat. Add thyme, garlic, pepper, salt and 2/3 cup water. Simmer on medium low heat for thirty minutes. Prepare a roux by melting 1/2 cup butter in a sauté pan then whisking in 1/2 cup flour. Add a bit of the hot liquid from the onion mixture to the roux, whisking to blend. Slowly add roux mixture to soup, whisking constantly to avoid lumps, until well blended. Add half & half, mix well, simmer for another 10 minutes, and serve. Makes 1 gallon.